Dagupan, Tarlac, Pampanga, Laguna and Bulacan were the five provincial destinations of Gantimpala Theater's Katipunan: Mga Anak ng Bayan. More than 100,000 audiences have experienced the Joel Lamangan and Jun Pablo directed musical with Sandino Martin as Andres Bonifacio, Anna Fegi and Rita de Guzman as Gregoria de Jesus and RJ Jimenez as Emilio Jacinto. 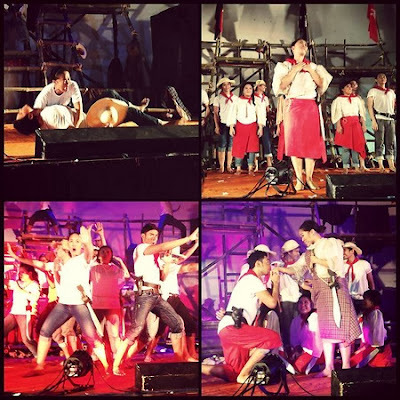 Thrilled were the people who watched the musical described as “Andres Bonifacio in steroids,” by blogger Michael King Urieta. “Frankly, I thought it will bore me but when the musical started, Lupang Hinirang pa lang, I was hooked. I had goose bumps all through out the show. When the whole cast sang Pilipinas Kong Mahal, I was in tears,” averred Mayette Lopez Durante. The Katipunan artists are in rapture as they shared their tales. “When I saw the Katipuneros dying one by one, it came to a point when all the voices shouted 'Kalayaan!' and the of singing 'Sugod Mga Kapatid!' were diminished to a trio of Emilio Jacinto, Gregoria De Jesus and Andres Bonifacio, a beautiful and eye opening moment happened,| this when Sandino Martin took a deep breath and suspended it, and altogether, I saw his knees weakened, shoulders drooped, the gripped in his bolo loosened and I was sure that at this point a howl of defeat will be heard, the moment he releases the breath that he is struggling to suspend, to my surprise his gripped tightened, took a courageous fighting stand and simultaneously raised his bolo as he sang his last word Sugod!!!!' Bravo Sandino!” exclaimed librettist Jose Jeffrey Camañag. Brace yourself Manila as Katipunan: Mga Anak ng Bayan rocks the metro on November 5, (9:30 AM & 1pm), exclusively showing at Colegio de San Agustin in Dasmariñas Village, Makati City, November 20, (6pm. ), November 21 & 22, (10am/2pm), at the AFP Theater, Quezon City, November 29, (7pm) at Bonifacio High Street Open Field, November 30, Taguig University, and on December 7, (9AM/12nn/3pm), Montano Hall, Cavite City. Assisting directors Lamangan and Pablo to mount the musical are Bonifacio Ilagan, writer, Jose Jeffrey Camañag, libretto, RJ Jimenez, music; Sonny Aniceto, set design, Ninya Bedruz, light design and production and stage manager is Cicey Alejo. For tickets and queries, AFP Theater shows, call: (63 2) 998-5622, (63 2) 872-0261; Taguig shows, call (63 2) 528-0603 or send an SMS to (63 921) 528-6308 and Cavite shows, send an SMS to (63 916) 275-9938. EDSA corner Col. Bonny Serrano Ave.